James Van Praagh's unique paranormal experiences during the past 30 years have been recorded in his early best-selling books Talking To Heaven, Reaching To Heaven, and Healing Grief. His fourth book is the proclaimed Heaven and Earth - Making the Psychic Connection. In September 2003, teens were introduced to Looking Beyond: A Teen's Guide to the Spiritual World. In November of that same year his book Meditations with James Van Praagh brought a new awareness to the meditation experience. Ghosts Among Us was released to critical acclaim in May 2008 and quickly landed on the New York Times Bestseller list and #1 on Amazon.com Bestseller list. In 2009 he released the much anticipated Unfinished Business and was followed by his newest book, Growing Up in Heaven, released in 2011. James Van Praagh shared his extraordinary gift on television with a daytime talk show of his own entitled Beyond With James Van Praagh. The show aired in the U.S. from September 2002 through September 2003 and is still showing in syndication in Europe, Australia and South America. In April 2002, James began an ongoing relationship with the CBS network and produced an incredibly successful mini-series Living With The Dead (title was later changed to Talking to Heaven), inspired by his first book Talking To Heaven. This mini-series starred Ted Danson and Mary Steenburgen and was the highest rated show for CBS in two years. In October 2004 his second successful CBS project aired entitled The Dead Will Tell starring Anne Heche and Eva Longoria. James Van Praagh was Co-Executive Producer of the CBS primetime series Ghost Whisperer starring Jennifer Love Hewitt. This show premiered in September 2005 and became the #1 Friday night drama for CBS. It ran for five seasons and is currently seen in syndication over 200 markets worldwide. To assist others in spiritual awareness, James Van Praagh travels the world teaching mediumship development classes, hosting spiritual cruises, and conducting sold-out seminars. He takes pride in having built a web site that encourages spiritual learning, grief support and friendships through its many online communities, resources and activities. "The books, CDs, seminars, classes, web site and television projects are ways to share my abilities and the message that our personalities do indeed survive death. My greatest satisfaction in doing this work is witnessing an instantaneous change in people," states James Van Praagh about his work. "When someone is alone and overwhelmed by grief, life seems over. But, when I'm able to help teach someone to make contact with a loved one, their grief and loneliness disappears and proper closure can take place" adds James. And so…"When a bright smile overcomes tears, it becomes a smile that can light up the world!" During his early days in Los Angeles, James was invited to attend a session with a medium, although he didn't even know at that time what a medium was. Given that, he was understandably dubious when the medium informed James that he would be doing the same work within two years. "My first reaction was, I have enough trouble dealing with the living; why do I want to talk to the dead?" 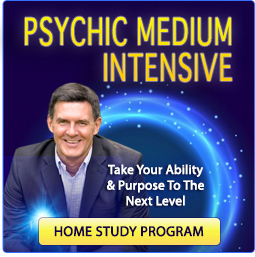 As James' sensitivity increased, he began doing psychic readings for friends. During these readings, he began receiving detailed messages from the beyond. Though at first this seemed bizarre, the more he learned, the more he could not deny the fact that he had the gift to reach beyond the familiar plane of existence we call life. Today, James is recognized as one of the foremost mediums in the world. Naturally, there remain skeptics about his abilities. James, however, is the first to say that he welcomes healthy skepticism, declaring, in fact, that he is a skeptic himself. "I believe that I am doing this, but I don't believe that just anyone can do this. 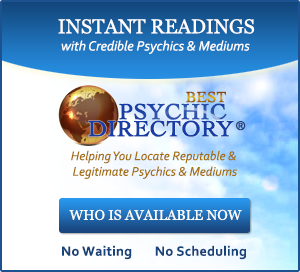 All mediums are psychics, but not all psychics are mediums." A psychic senses energy around the living people or objects. A medium not only senses energy, but is able to interface between the slower vibrations of the physical world and the much faster ones of the spirit world. Though James is quick to point out that his gift does not provide insights into the future, he is able to provide detailed evidential proof that a loved one survived death. Surviving death may seem to be the supreme oxymoron, but he has a firm belief that we are all spirit beings, and that there is far more to our life than our life span. Ultimately, James feels extremely fortunate to be a conduit of comfort, healing, and most importantly, love. "As a medium, I have never experienced anything but love and compassion and healing in my work," he avows. "It is the love bond between people which allows me to make the connection between the living and the dead." His very natural, easy-going style would lead you to believe that James Van Praagh is chatting with a friend on the telephone, not communicating messages from the grave. James is a survival evidence medium, meaning that he is able to bridge the gap between two planes of existence, that of the living and that of the dead, by providing evidential proof of life after death via detailed messages. "I'm clairsentient," he explains, "which simply means clear feeling. I feel the emotions and personalities of the deceased. I am also clairvoyant," he adds, clarifying that, "the first is feeling, the second is seeing, very much like Whoopi Goldberg in the movie, Ghost." The true essence of the messages are the feelings behind the words. James is an expert on this subject, since he has been in touch with those feelings most of his adult life. "The spirits communicate by their emotions. No words exist in the English language, or any other for that matter, which can describe the intense sensations." Personality traits come in as well. If a person was talkative while alive, he will come through with plenty to say. James also relays physical traits and death conditions as evidence. "If I convey recognizable evidence along with even a fraction of the loving energy behind the message, I consider the reading successful." James' public popularity began during his appearances on the NBC talk show The Other Side. 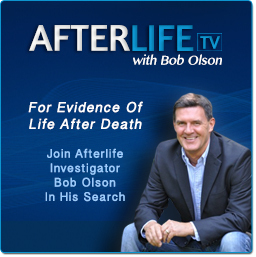 The show concentrated on paranormal issues, and James became the favorite guest and resident expert on the subject of life after death. Even Howard Rosenberg, the Los Angeles Times distinguished television critic, dubbed James "spectacular". Through the years his message of hope has touched a great many more people due to his television appearances on such shows as Oprah, Larry King Live, Dr. Phil, A&E Biography, Maury Povich, 20/20, and 48 Hours. 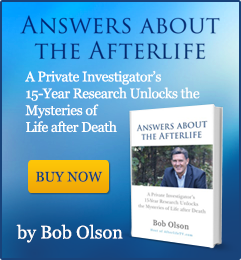 His unique paranormal experiences during the past twenty-five years have seen him author best-selling books, create meditation programs and development videos, teach mediumship classes, conduct seminars to sold-out audiences, and produce successful television projects.